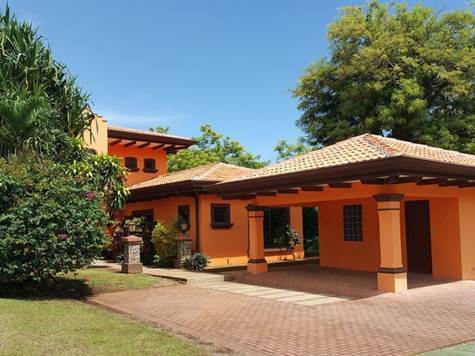 Casa Namaste is two-story residence located in the prestigious residential community of Altos del Cacique. Proximity and easy access to both Playas del Coco and Playa Hermosa and a short drive to the Liberia Airport, as well as the CIMA hospital, restaurants, nightlife, water sports and services. The residence rests on one of the most scenic parcels overlooking Playas del Coco and The Gulf of Papagayo offering breathtaking sunset views. The welcoming main entrance provides a see-thru view of the ocean and the infinity pool. Three well appointed bedrooms and three full bathrooms in total. The split ground level offers architectural separation between the living area and two bedroom. One of the bedroom has an in-suite full bathroom. The other bedroom, of equal size, has ocean views and easy access to the third bathroom. The wrought-iron and mahogany staircase leads to the second floor, reserved for the spacious master bedroom for maximum privacy. The covered terrace provides the same amazing views as the ground level. A double sliding door opens-up to the mezzanine area with ocean views. The master bathroom has a his and hers sink, Jacuzzi, walking shower and huge walking closet as well as a separate room for the toilet. Gourmet kitchen with granite counter tops, bar counter eating area, stainless steel appliances opened to the dining/ living room with 360 degree views. The private infinity edge pool is annexed to the sand-stone tiled area perfect for enjoying the spectacular daily sunsets while sipping cocktails. New wrought-iron security gates. New Spanish-style tiled roof. New Air Conditioning Units throughout with individual units for every room for energy efficient cooling. New double panel windows. New electric system and new water heater. Two water filtration provides safe drinking water. New swimming pool mechanical system.